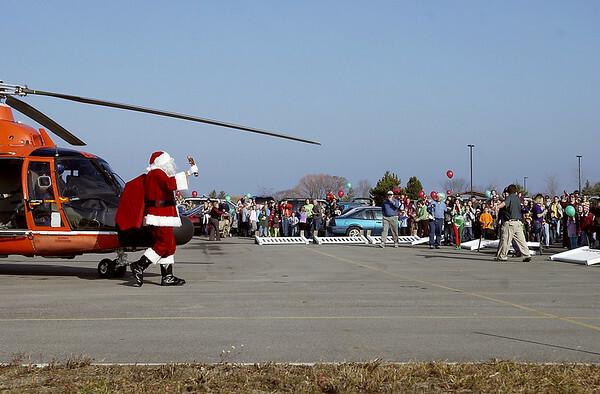 Santa Claus arrives by U.S. Coast Guard helicopter instead of reindeer Saturday at the Great Wolf Lodge in Traverse City as part of an event to kick off the Toys for Tots campaign in northern Michigan. The event also featured Christmas carols sung by Old Mission and Blair Elementary school students, along with police and fire displays. The Toys for Tots campaign runs through December 20. The toys are distributed through family service agencies, including the Father Fred Foundation, Salvation Army, Women's Resource Center and Goodwill Inn.